Record-breaking heritage service to Fleetwood! Something really rather special happened on the Blackpool tramway on Saturday 15th July 2017 with relatively little fanfare, when an enhanced heritage service operated as part of the Fleetwood ‘Tram Sunday’ weekend. 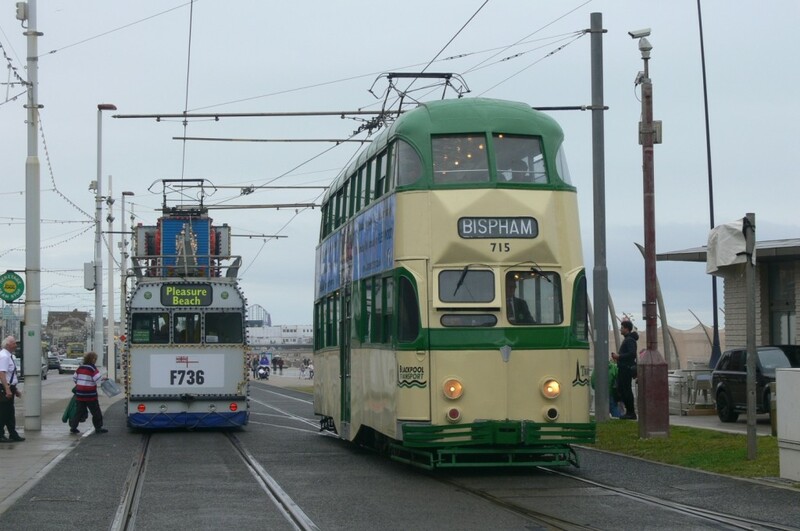 Normally, Tram Sunday itself is the main event of the weekend but arguably the Saturday was even better for tram enthusiasts, with the most frequent heritage tram service to Fleetwood since 2009! 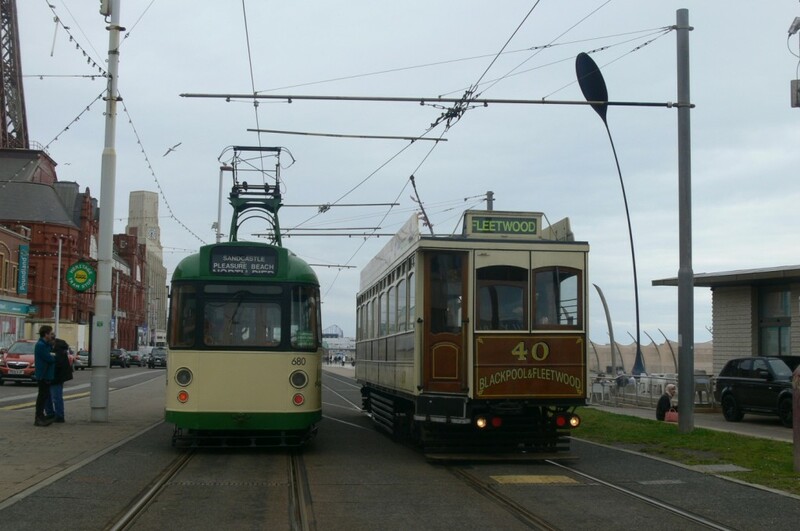 As was announced on this website and on the usual social media channels, an ambitious turn-out of eight heritage trams was planned for Saturday 15th July with a total of eighteen scheduled trips to Fleetwood between them, a new record for the heritage era! In spite of poor weather, with some heavy showers at various times during the day, a varied and interesting selection of trams were used comprising Box car 40, Brush car 623, Centenary car 648, Ex-Towing Railcoach 680, Balloon 715, Millennium car 718, Balloon 723 and last but certainly not least, ‘HMS Blackpool’ 736. All of these ran to Fleetwood at least once apart from 680, with some managing three runs through to the northern terminus – a rare treat with such exotic rolling stock as the illuminated Frigate, and a welcome throwback to days gone by for the 1914-built Box car. However, the star attraction was undoubtedly Brush car 623 which was making its first appearance in ‘normal’ heritage service following a special launch tour the previous evening. Once again, 623 performed faultlessly all day and proved extremely popular. Indeed, the day’s activities seemed to attract a good crowd with healthy loadings on most journeys despite the high frequency of service provided which could have split the crowds enough to leave some trams empty. It was noticed that the service trams were also very busy, which bodes well for the summer season ahead. 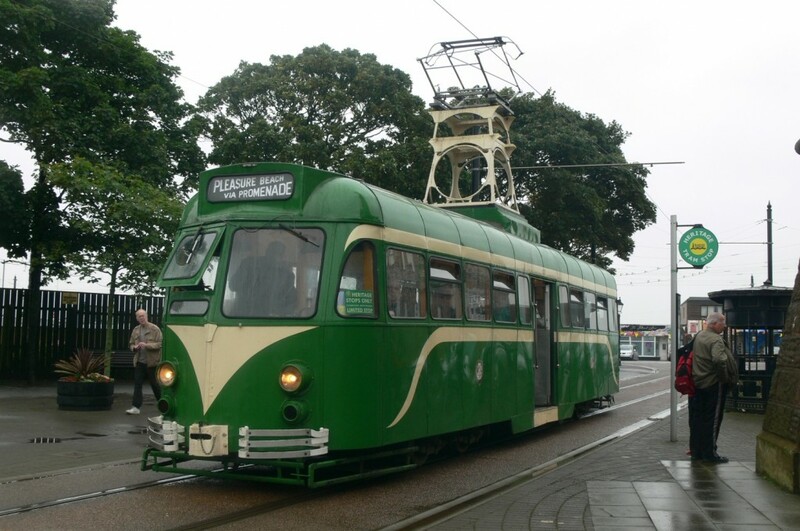 Blackpool Heritage Tram Tours deserve immense credit for putting together such an impressive timetable. Apart from a minor issue early on in the day which resulted in Balloon cars 715 and 723 swapping routes after the latter became delayed, everything ran as planned and the schedules gave plenty of scope for ‘leaping’ between trams to get a ride on multiple different cars, as well as creating some fantastic photo opportunities. After a few slightly samey gold event days, this may well have been one of the best ever and showed that even with some popular trams currently out of action, there is still plenty of potential to create exciting and enjoyable events that will bring lots of people to Blackpool. Well done to all concerned! Brush Railcoach 623 proudly stands on Pharos Street in Fleetwood before heading back south on its first trip to the Ferry in public service since November 2009. Balloon 715 and the Frigate 736 pass at North Pier on the afternoon of 15th July. 2 Responses to Record-breaking heritage service to Fleetwood! In terms of timetabled operation Saturday has to be one of my favourite since the Upgrade. Its just a pity weather combined with legacy of chest infection prevented me really making most of it in terms of photographic opportunities. Its a platform to build on though. Purely as an individual enthusiast who wad riding cant help but think should of been more enthusiasts present. Every extra £11 ticket helps justify more and more ambitious programs. Without wishing to cause offence i do think greater emphasis needed to placed on the enhanced gold+ operation significant period of time prior to event to really start to maximise turnout. It was just wonderful to spend the Morning in the street at Fleetwood photographing a frequent service of Heritage trams having arrived on 648 and going back on 623! It really was a throwback to 2009. Sadly while there were people riding only a handful were also about photographing this show but it wasn’t that wet and was wonderful! I even managed to do some shopping and get a new RCD for use at this weekends Festival of Model Tramways from a very old established Fleetwood shop between photos! I even found that the newsagent in North Albert St had taken over selling “Ships of Mann” after the closure of Lighthouse Stationers. Chris is right there should have been more attention drawn to the Service being run, not just the Timetable but also a “banner” to draw attention to the special features.